The US regulator has started its review of Sanofi and Lexicon Pharma’s sotagliflozin for type 1 diabetes, which the firms say could have blockbuster potential. Sotagliflozin – which has the proposed trade name Zynquista – has been developed as an add-on therapy to insulin injections to help improve blood sugar control in type 1, early-onset diabetes, and if approved by the FDA would be the first oral antidiabetic drug (OAD) for this indication. It was filed for approval in Europe in March. The new drug is a key element in Sanofi’s plans to rebuild its diabetes franchise after the loss of patent protection for big-selling basal insulin Lantus (insulin glargine), which has led to a slump in sales for the unit. Sales of Lantus were just over $1bn in the first quarter of the year, having been a $8.5bn brand at its peak in 2014. While not expected to scale those heights, sotagliflozin could be a valuable addition to the franchise, with EvaluatePharma estimating it could have sales of almost $1.2bn by 2022 if it reaches the market on schedule. The drug is a dual inhibitor of SGLT1 and SGLT2 and is thought to work by reducing glucose absorption in the gastrointestinal tract and glucose reabsorption by the kidneys, as well as stimulating the release of GLP-1. 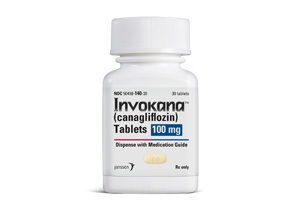 The idea is that the dual targeting may provide added glucose control with fewer side effects relative to selective SGLT2 inhibitors, such as Johnson & Johnson’s Invokana (pictured), Eli Lilly/Boehringer Ingelheim's Jardiance and Farxiga from AstraZeneca. The SGLT2-selective drugs are approved to date only for type 2 diabetes. According to Lexicon, sotagliflozin is also being tested in type 2 diabetes with phase III results due in 2019. The FDA filing for sotagliflozin is based on data from the inTandem clinical trial program which includes three phase III clinical trials of sotagliflozin in approximately 3,000 adults with inadequately controlled type 1 diabetes. The results suggest adding the drug to insulin therapy can improve glucose control as measured by haemoglobin A1c levels, with a reduced risk of potentially dangerous low blood sugar levels (hypoglycaemia). Sanofi licensed rights to sotagliflozin from Lexicon in 2015 for $300m upfront and up to $1.4bn in development, regulatory and sales milestone payments plus double-digit royalties. Lexicon exercised an option to co-promote the drug in the US for the treatment of type 1 diabetes last year.